Looking at our “this week last year” list, there is only one entry this week – Scotland. Because that’s where we were on holiday last year. A quick browse through the pictures revealed ballotine of pheasant with barley risotto. I remember that barley risotto as being rather good, but it was normal (i.e. rice) risotto with some barley added to it. We decided to try one that was only barley. This is cooked in much the same way as a normal risotto, except that it took a bit longer to cook. Add some oil to a saucepan, over medium heat, and add the celery and onion and soften. After a few minutes, add the carrot, parsnip, bay leaf and other herbs. Stir a little, season with some salt and pepper, then turn down the heat and put the lid on the saucepan to let the vegetables sweat. After a few more minutes, add the garlic, stir, and leave to sweat for a few more minutes. Meanwhile, heat up the stock in another saucepan. Now turn up the heat and add a little more oil if it has dried out. Add the barley and stir. We found that it didn’t start to go translucent in the way that rice does, but after a few minutes it did start to brown a little. At this point, add the wine and stir until it has almost all boiled off. Turn down the heat and add a ladle of stock. Stir until it has almost all been absorbed, then add some more. Keep going until the stock is all incorporated. If the barley is still not cooked after adding all the stock, then keep adding water until it is cooked. Stir in some grated parmesan, check for seasoning, and serve. This didn’t seem like that much when we served it, but it was very filling and did feed us both quite well. 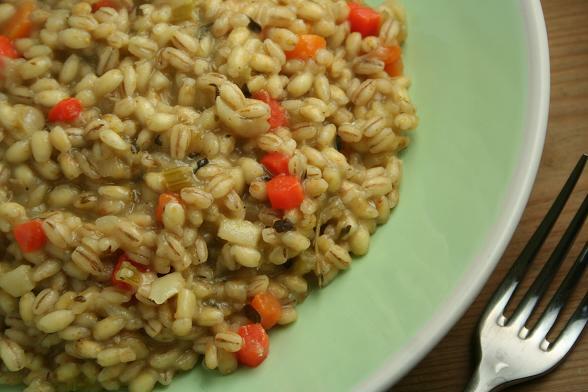 Subscribe to comments with RSS	or TrackBack to 'Barley Risotto with Root Vegetables'. Over here barley drink is very common. In fact, my mum just made it yesterday! I haven’t tried making risotto yet because that particular grain is very expensive here…. But barley is highly afforable! I am bookmarking this! I love anything with barley in, such good winter fodder!